Admiral has delivered the first of its C Force 50 superyachts _Ouranos _to her new owner, a repeat client who plans to spend the summer cruising the Mediterranean and make her available for charter. 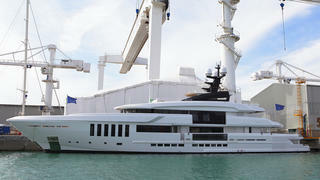 Ouranos is a full displacement superyacht built in steel and aluminium by the Italian Sea Group. With exterior design by Unielle Yacht Design, and an interior by Admiral Centro Stile that features natural leathers and refined joinery, she exemplifies the new breed of luxury yachts from Admiral. The most striking design innovation on the C Force range is the double-high central window. Explaining this feature, Jure Bukavec from Unielle Yacht Design said: "The main idea is to bring more light where is the most needed, into the main and upper deck salon. In this way, we create a penthouse style interior ambiance. Seen from the exterior, the window is a straight vertical cut which doesn't interrupt the exterior lines”. The C Force 50 has generous interior volumes, despite measuring below the 500GRT mark. With space to accommodate 12 guests, she boasts a master suite located forward on the main deck, three double cabins and two twin cabins. "I guess that Ouranos' interiors express the contemporary lifestyle state-of-the-art without being overcharged of hyper-decoration; 'Less is More' is still current," said Arch. Gian Marco Campanino, who designed the interior with Admiral Centro Stile. "Without giving up high-end finishings, this yacht establishes a new luxury idea, made of purity and linearity. Sophisticated atmospheres and subtle colour shades make her interior something very cozy although definitely luxurious; precious materials and outstanding art pieces speak for themselves. Without being a glitzy boat, she best represents the new ideal of elegance". With twin Caterpillar engines driving fixed pitch propellers, Ouranos is expected to reach a maximum speed of 15 knots and a cruising speed of 14 knots. At a construction ceremony at the yard in October 2014, Italian Sea Group Vice President, Francesco Carbone said: “We are particularly proud to celebrate a new construction for an owner and a family we have known for years and with whom we have a true respectful relationship. The contract for the new build was sold by Cape4 Yachting in 2013. One of the newest superyachts available for charter, prices on Ouranos start at €210,000 per week.